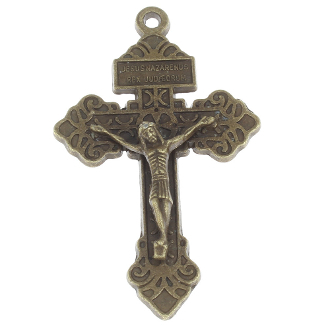 Pardon Crucifix BRONZE Finish 2" INDULGENCE CRUCIFIX- --Rosary making parts Necklace-- Sold Bulk Prayer card not included. 1. Whoever carries on his person the Pardon Crucifix may thereby gain an INDULGENCE once a day. 2. For devoutly kissing the Crucifix, an indulgence. Blessed Virgin Mary to pray to the Lord our God for me." Holy Cross, the Immaculate Conception and the Seven Dolors of the Blessed Virgin. among the members of the Catholic Church. Pardon Crucifix are applicable to the souls in purgatory.